Navien tankless water heaters are 98% efficient and are a qualified energy star partner. With a Navien in Toronto you get the best of both worlds, great value and ultimate savings. A Navien can provide you with endless hot water as the unit will fire only when you want hot water and for as long as you need it. The lifespan of a Navien is 20 plus years and the manufacture provides a warranty for 15 years on them. By the time your conventional tank type water heater hits 15 years it will be so full of calcium and build up it you will be lucky if it is achieving more than 20% efficiency. Meanwhile if you had had one of our Toronto reps come by and install a tankless your system would still be operating in the high 90% efficiency range. Servicing the Toronto and area region has shown one thing to us, houses are small and space is important to home owners. 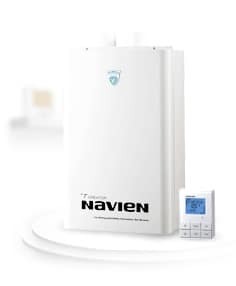 A Navien tankless can reduce your water heaters footprint by over 90% as it simply mounts on the wall. Take back some of your space with a tankless heater. Not all Toronto and area homes can meet the venting and positioning requirements necessary and thus its important to understand the requirements that need to be met. If you live in Toronto or surrounding area we do offer free assesments where some one can come to your home and ensure that a tankless will work for youand your home. Again this is free for Toronto and surrounding areas. Otherwise if your handy you can check out the diagram to see for yourself if a tankless will fit.